SideBlog: Places I Must One Da..
Today is the 14th of Tiki Month, I mean February, so I thought I’d look for a Valentine’s Tiki drink to give a whirl. Over at my new February lurking grounds, Tiki Central, I ran across this little offering, The Pink Wink. Grenadine should be approximately 1 tsp per ounce in a part. Stir lovingly with ice until well chilled. Strain into cocktail glass. 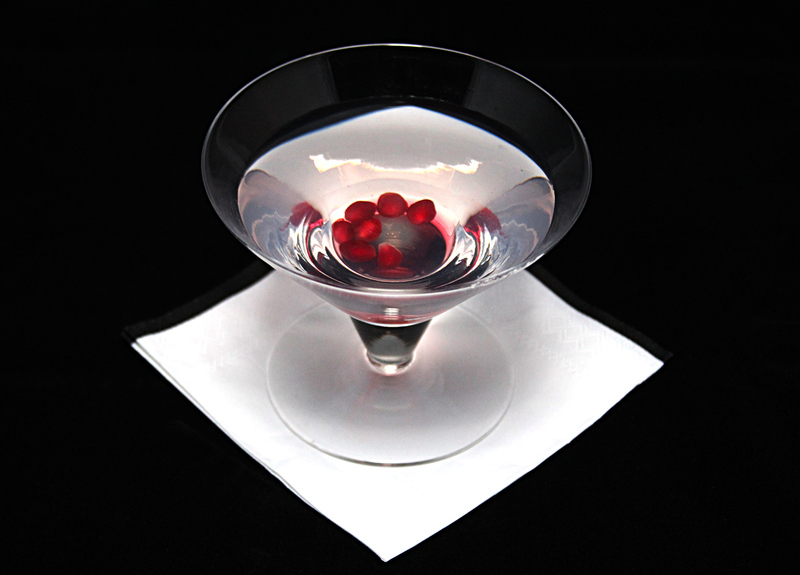 Garnish with pomegranate arils at the bottom of the glass, and drizzle more grenadine into the drink to settle among the arils. I took a few liberties with WoofMutt’s recipe. First, I replaced his cherry garnish with the pomegranate arils because I think they are more Tiki-like, and more importantly so that whomever you offer them to will be yours forever! Second, I guess the grenadine used in the original is the artificially colored stuff, because my natural grenadine made no impact on the color of this drink in the called for amount. I doubled it, and also drizzled a bit more to settle into the bottom of the glass among the pomegranate arils. The result is an odd duck, but exotic. Contrary to the poster’s original comments, I don’t see this one wining over any gin-o-phobes. And and the frou-frou drink crowd won’t get it either. But if you are looking for a Tikified Martini, with some pleasant Valentine’s Day symbolism, the Pink Wink may be your destination. This drink name sounds pretty dirty, am I wrong? Regardless, I’m making this tonight. I can’t believe that your crystal-clear picture there has the grenadine in it. My current batch of grenadine isn’t the strongest I’ve ever made, but yeah, there is actually a fair amount in there. And yes, it’s a very dirty Martini. Hope you enjoy it. This drink was enjoyable, but much less dry than I was (unrightfully) hoping. Honestly, I really just enjoy any drink that takes coconut rum seriously. The hue of mine was on the light brown side, not nearly as gorgeous as yours. I came up with this drink 7 years ago. These days I’d possibly skew it towards being drier (for myself, definitely). Even with the typical grenadine the color is meant to be a very pale pink. Nice post which the grenadine used in the original is the artificially colored stuff, because my natural grenadine made no impact on the color of this drink in the called for amount. I doubled it, and also drizzled a bit more to settle into the bottom of the glass among the pomegranate arils. Thanks a lot for posting this article.